Only allow children access to toy axes, swords and other costume accessories under strict supervision. Do not give children products that are intended for adult use only. 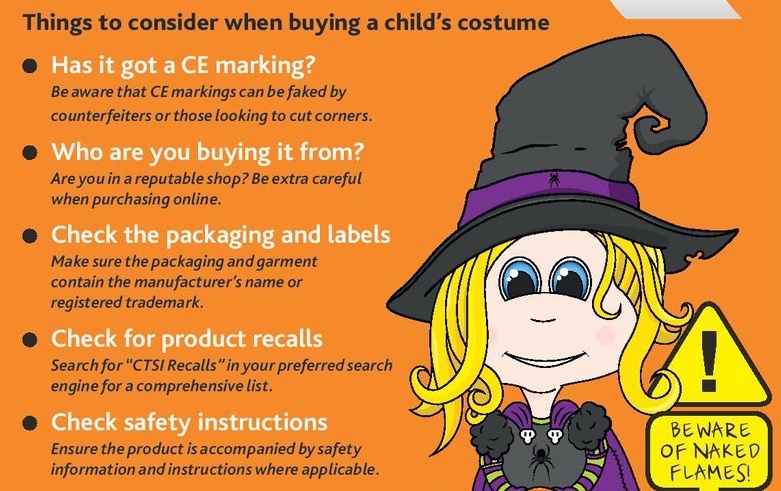 Look for the CE European Safety Mark when purchasing Halloween costumes and associated items. Use well established shops to ensure that the products come from reputable suppliers – avoid purchasing items which do not carry the mark. Flowing items such as fake beards, or capes can become hazardous if they are likely to be worn near naked flames such as candles. Ensure that you use only fire retardant costumes and masks for dressing up. Remember that plastic capes and bin liners which are sometimes used as a Halloween costume can pose a fire risk. If your children are going out trick or treating please think about the costumes you buy and where you get them from. Halloween is a fun and exciting time for children and we would like them to be able to enjoy it safely. In recent years, Trading Standards services have uncovered novelty torches that burn hands, flammable spider webs and face paints containing heavy metals such as lead. Every year children and adults around the UK are injured in accidents where lighted candles or fireworks have ignited flammable fur and hair on Halloween costumes. Plastic capes are also a risk and even home-made costumes containing crepe paper, bin bags or sheets may be hazardous. Costumes should have a degree of fire resistance so if they caught light, for example on a candle at a Halloween party, they would burn slowly, allowing the wearer to remove the item before an injury was caused. In the UK the labelling of cosmetics is governed by the Cosmetic Products (Safety) Regulations 2003. These Regulations define a cosmetic as being a substance that is used on the skin, lips, teeth, nails or hair which has the effect of cleansing, perfuming, protecting, changing the appearance of or correcting odours. any warnings/precautionary information to adhere to. When choosing Halloween make-up please ensure that all of the above information is either on the outer packaging of the item, on the item itself or on a label attached to it. Also ensure that all warnings are followed and that these products are used only in the way specified on the product itself.